In an ideal world, staff meetings would be an exciting event that your colleagues attend eagerly, every time. They would jump at the opportunity to share their ideas. They would be open and receptive to changes that the company wants to facilitate. They wouldn’t play Candy Crush on their phones while pretending to pay attention during presentations. But do you ever wonder why this may not be the case for your team? While staff meetings are a vital time to share pertinent information, they are not always as structured, efficient and gratifying as they could be, leaving employees with questions running through their minds, such as, “Why are we really here?” “They couldn’t have just sent this in an email?” and the ever popular, “When will they get to the point?” In order to make the best use of your time and energy as well as your staff’s, here are a few helpful tips for a successful staff meeting. 1. Stick to an agenda. We have all, at some point, shown up to a meeting that felt unorganized and lacked clear direction of focus. This is what agendas are for. Plan out what you are going to discuss and how much time you will allot for each topic. This way, you will be sure to address all of the important points without being side-tracked, increasing the productivity of your meeting. This article on the Harvard Business Review has some excellent tips for designing an effective meeting agenda. 2. Ask your team for input ahead of time. If your staff has questions, comments or concerns they want to address, try having them submit these items to you to add to the meeting agenda. Everyone in a workplace appreciates being heard and validated, and team meetings are a perfect space for the staff to provide input that may be integral to moving your efforts forward. 3. Leave room for spontaneity. It is always a good rule of thumb to expect the unexpected. When you are planning your agenda, allow some time for open discussion and creativity by not cramming in so many items that you do not have time to get feedback and answer questions. This way, you will be sure to thoroughly cover all of your key points. If you end up finishing early, then feel free to let everyone go. Your staff will appreciate you for valuing their time! Is there an inspirational video you would like to share? A team building exercise you’d like to try? An offsite location you’d like to meet? How about a guest speaker that you’ve heard people raving about? 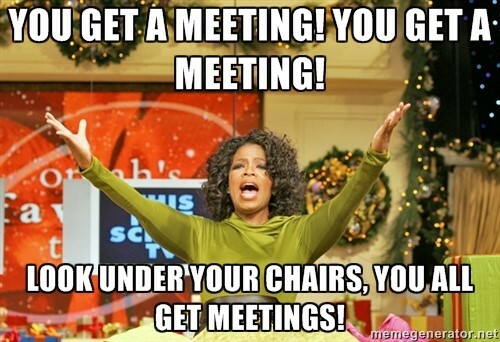 There are plenty of ways to make your meetings fun and rewarding for all in attendance. Give people something to look forward to by thinking outside of the box. At Advantedge Workspaces, we pride ourselves on providing the highest quality meeting space and services to provide you everything you need for a successful meeting. If you’re looking for high quality A/V equipment to share presentations, beverage service to caffeinate your team, assistance with printing meeting materials, etc., we’ve got you covered! Contact us to secure your next meeting room today!